Ancestral evil haunts these woods. There is something here that scorns life. I feel a malevolent presence, focused on me, like those eyes that glow in the thickets. She is here, I know it. His thousand offspring are unleashed around me. I feel their presence and my hair stand on my neck. They waited, conspired for centuries and today we are all lost. Here, in the middle of nowhere, no one will hear my screams. The shadows will swallow my voice and the suffocating presence of the trees will start to crush me. Welcome to The Call of the Forest, the expansion that carries The Remains of Terror to the edge of dark, untamed moors. The main feature of this expansion comes from its five stories with revolutionary concepts. Each story offers a unique gaming experience, from a survival plot and fully cooperative betrayal to a stunning role reversal that requires the guardian to explore the map and solve the puzzles. Each story upsets what players think they know about Horror Aboriginals. 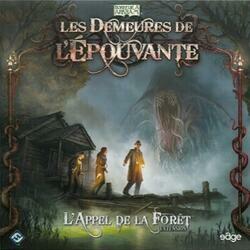 Appel de la Forêt also features new monsters, ingenious new investigators and nearly 250 cards that will transform your experiences with The Remains of Terror. Pray to get out of these woods alive.